National Trust - The National Trust have many October half-term events across the country for families to take part in. Join in with 50 things to do before you’re 11 ¾ challenges and other outdoor activities, from den building and trails to archery and wild art. Plus cooking demonstrations and harvest festivals. RSPB - Pack their binoculars and take your little adventurers on a wild day out with RSPB. There’s interactive discovery zones where families can pond dip and become wildlife explorers for the day. Gramping – A relatively new term for when grandparents go camping, take the little ones camping and they will think you are the coolest grandparent ever. Find insects and identify them - Kids are fascinated by creepy crawlies, so explore the garden this half term. If you want to catch them, grab an old jar to temporarily house the insect, then your grandchild can have a go at identifying their new friend. Decorate a plant pot - Get your grandchild to decorate their very own plant pot. All you will need is a terracotta pot and some emulsion paint in a range of colours. To avoid mess, put some old newspaper down, then your child's imagination can run wild. They can personalise it with their name or even paint their own flowers on the pot. Plus get into the garden and get them to help you do some weeding, plant some flowers, or even just water the plants. Showtime - Let your grandchild take centre stage by putting on a play. Pull together costumes from a dress-up box (or the wardrobe) and act out a familiar fairy tale, or write your own play. Play your own version of Masterchef - See what’s already in the pantry, fridge or freezer and, using those ingredients, try to whip up a meal. Or why not create a cooking show? It’s amazing how much more children will eat when they make the food themselves, so encourage the kids to cook and teach them how. Help with prepping the ingredients and come up with a show title and intro together. Then let their imaginations take over. Get them to explain what they’re making as they cook and, for extra fun, record the show to play back for parents later. Visit your local library - look for books that you loved as a child that you can share together, or newer titles. Nothing can beat the feeling of reading a story together. If you get a comic book, you can work through the puzzles together or discuss the pictures and where the stickers might go. Make a time capsule - Pick out a few objects that represent your grandchild’s interests, such as animals or a pop star, as well as photographs. Put these items in a plastic box or jar, date it and find a good spot to bury it. 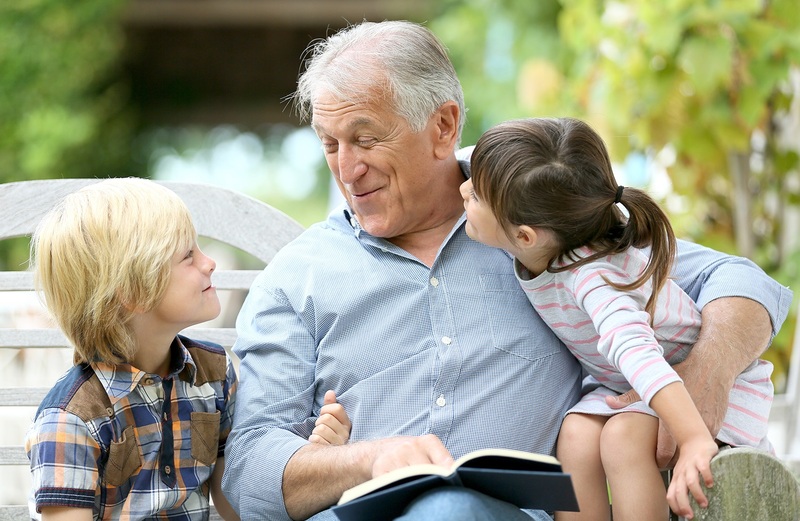 Teach something new - Grandparents are the perfect partners for teaching a hobby, like baking, fishing, knitting, crafting or carpentry. Discuss your interests with the grandkids. Can you sew or paint? Maybe you have an interesting skill that you could pass to your grandchildren. Take the paint box, glue, and other craft materials outside and let the children get as messy as you dare! Use plastic bottles, egg boxes and kitchen roll tubes, then see what they can create. Treasure hunt…write some clues on pieces of paper or come up with a map, and let the children find the treasure. Plan a holiday - One in four grandparents goes on holiday with their grandchildren, with the seaside the most popular getaway for grandparents and grandchildren. It’s never too early to start planning your next big adventure, so get booking for Christmas and February Half Term. Away from your grandkids? Send postcards, drawings and letters to one another on a regular basis. Email is nice, but nothing beats an actual letter or a drawing you can put up on the fridge.